(Nanowerk News) Researchers have made an experimental breakthrough in explaining a rare property of an exotic magnetic material, potentially opening a path to a host of new technologies. From information storage to magnetic refrigeration, many of tomorrow's most promising innovations rely on sophisticated magnetic materials, and this discovery opens the door to harnessing the physics that governs those materials. The work, led by Brookhaven National Laboratory physicist Ignace Jarrige, and University of Connecticut professor Jason Hancock, together with collaborators at the Argonne National Laboratory and in Japan, marks a major advance in the search for practical materials that will enable several types of next-generation technology. A paper describing the team's results was published this week in the journal Physical Review Letters. From Left to Right: Jason Hancock, Diego Casa, and Jung-ho Kim, shown with one of the instruments used in the experiment. The work is related to the Kondo Effect, a physical phenomenon that explains how magnetic impurities affect the electrical resistance of materials. The researchers were looking at a material called ytterbium-indium-copper-four (usually written using its chemical formula: YbInCu4). YbInCu4 has long been known to undergo a unique transition as a result of changing temperature. Below a certain temperature, the material's magnetism disappears, while above that temperature, it is strongly magnetic. This transition, which has puzzled physicists for decades, has recently revealed its secret. "We detected a gap in the electronic spectrum, similar to that found in semiconductors like silicon, whose energy shift at the transition causes the Kondo Effect to strengthen sharply," said Jarrige. Electronic energy gaps define how electrons move (or don't move) within the material, and are the critical component in understanding the electrical and magnetic properties of materials. "Our discovery goes to show that tailored semiconductor gaps can be used as a convenient knob to finely control the Kondo Effect and hence magnetism in technological materials," said Jarrige. 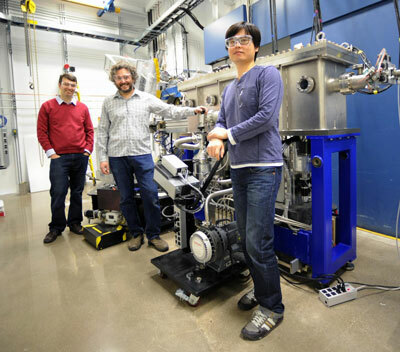 To uncover the energy gap, the team used a process called Resonant Inelastic X-Ray Scattering (RIXS), a new experimental technique that is made possible by an intense X-ray beam produced at a synchrotron operated by the Department of Energy and located at Argonne National Laboratory outside of Chicago. By placing materials in the focused X-ray beam and sensitively measuring and analyzing how the X-rays are scattered, the team was able to uncover elusive properties such as the energy gap and connect them to the enigmatic magnetic behavior. The new physics identified through this work suggest a roadmap to the development of materials with strong "magnetocaloric" properties, the tendency of a material to change temperature in the presence of a magnetic field. "The Kondo Effect in YbInCu4 turns on at a very low temperature of 42 Kelvin (-384F)," said Hancock, "but we now understand why it happens, which suggests that it could happen in other materials near room temperature." If that material is discovered, according to Hancock, it would revolutionize cooling technology. Household use of air conditioners in the US accounts for over $11 billion in energy costs and releases 100 million tons of carbon dioxide annually. Use of the magnetocaloric effect for magnetic refrigeration as an alternative to the mechanical fans and pumps in widespread use today could significantly reduce those numbers. In addition to its potential applications to technology, the work has advanced the state of the art in research. "The RIXS technique we have developed can be applied in other areas of basic energy science," said Hancock, noting that the development is very timely, and that it may be useful in the search for "topological Kondo insulators," materials which have been predicted in theory, but have yet to be discovered.